Autoheating occurs when the metabolic heat released by aerobic organisms is great enough to raise the temperature of a pile of organic materials. The two factors contributing to autoheating are the energy content of the material and the material’s insulating ability. High energy materials cause rapid growth, which creates heat. Highly insulating materials trap the heat. There are a number of situations in which knowing autoheating potential is important. If a compost pile goes cold, is it because the compost is nearly done, or because the pile is too dry for microbes to grow? If horse stall cleanings are piled in a worm bin, will the worms try to escape because the bin heats up? How much “green” should be mixed in with “brown” to get heat in a compost bin? If poultry litter is stacked 10 feet high in a barn, will the barn catch fire? This Fact Sheet gives step by step instructions to determine the autoheating potential of organic materials. Energy is provided by the material tested, insulation is provided by an inexpensive ice chest. Figure 1. 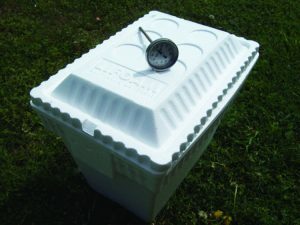 Suitable Styrofoam Cooler and Compost Thermometer for the Icebox test. Figure 2. Icebox Test Underway. Styrofoam Cooler – should have at least 1 cubic foot (30 qt) volume, 1 ½” thick wall thickness. Compost Thermometer – 6” long. Step 1: Fill the cooler completely with the material to be tested. Step 2: Add water to or drain the material so that it is damp. Step 3: Place the icebox in a room with as little temperature fluctuation as possible (basements are good). Record the temperature of the room with the compost thermometer. Stick the thermometer into the filled icebox. Record temperature. Step 4: Close the lid and let stand for 24 hours. Step 5: Record temperature of material in the icebox. Remove the thermometer and record room temperature. A 5F (2C) difference between icebox and room temperature after 24 hours indicates that the material will autoheat. Microorganisms need moisture to grow, but if it’s too wet, they stop growing. The best moisture content to run this test is 50 percent by weight. How do you know when the material is 50 percent moisture? One way is squeeze method. Grab some material and squeeze: If moisture drips out, it is too wet. If the clump in your hand crumbles when you release, it’s too dry. Not everyone likes to squeeze manure samples, though. You can get a rough estimate of moisture content of dark, organic materials by sight. If the compost looks damp, but does not shine in the light, then moisture content is about 50 percent. Sometimes raw, intact ingredients such as kitchen waste will not heat up over night on their own. Add a little active compost to seed the mix. A 10 to 1 ratio of test material to seed is enough. Make sure moisture content of the mixture is 50 percent. It’s important to place the icebox in an area with little change in temperature throughout the day. Although it’s insulated, the ice chest will gain heat from its surroundings. And because it’s insulated, the bin will not release that heat very quickly. Say, you check the temperature in the morning. The room temperature is at its lowest of the day in the morning, but the icebox might still be cooling off from yesterday afternoon. This would lead you to believe that the compost is autoheating, but in reality it’s just slow in cooling off. How Big a Difference in Temperature? The problem of false positives was given in the previous section. Another source of uncertainty is caused by the sensitivity of the thermometer. For instance, if you use a meat thermometer instead of a compost thermometer, you might not be able to read subtle changes in temperature due to the small dial size. The icebox test can be a fairly accurate measure of the relative energy content of organic matter. Huge, 20F, changes in temperature provide a fairly good indication that a compost pile will heat up to 120 F or 150 F. Determining the cut off between Phase I (heating) and Phase II (curing) composting is a little trickier. Take new samples each day for a number of days. The temperature rise in the icebox will taper off and eventually go to zero, indicating that the compost is starting to cure. Failure to autoheat may mean that the C:N ratio of the material is out of whack (too much green or brown in the mixture), or that something is inhibiting growth (such as salt). Also, just because organic matter does not autoheat, does not mean it is stable. Organic matter can still undergo major biological change, smell, and draw vermin even though it does not autoheat. 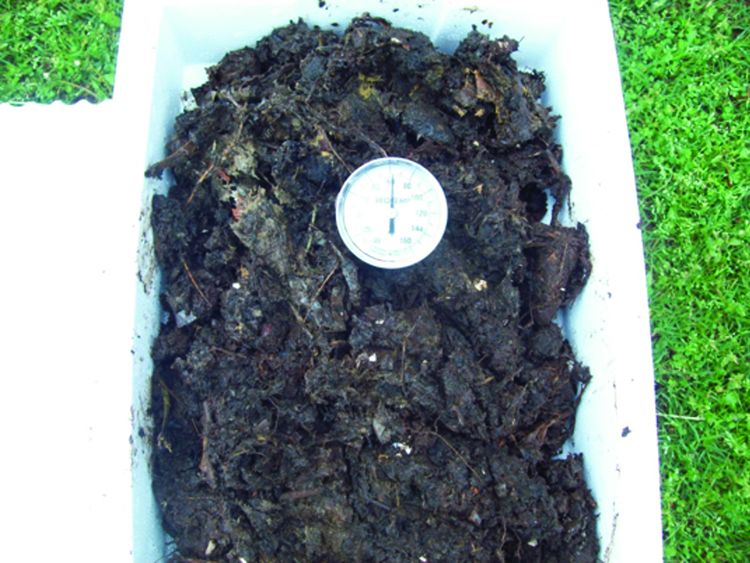 It is best to use Solvita™ or respiration tests to determine if compost is cured. Let’s go back to the situations brought up in the introduction. If a batch of compost taken from the bin heated up the icebox more than 5F, it’s time to moisten the bin, turn it once or twice, and keep composting. If it did not heat in the icebox, the compost is ready for curing. Horse stall cleanings tame enough for worms? After placing moist stall cleanings in the icebox overnight, it heated up 25F. This is pretty powerful stuff. Either compost it first, or place in the worm boxes in daily layers less than a quarter inch deep. Is it the right green to brown mix? A mixture of kitchen scraps and dried leaves failed to heat up the icebox, but it sure smelled bad a day later. This means the mixture is too green (too high in nitrogen). You need to add more brown. Double up the amount of leaves and try the icebox test again. If it heats at least 5oF, then you have found a good mixture. If it still doesn’t heat, add a little more seed. If it heats, adjust green to brown ratio again. Will chicken litter burn down the barn? If poultry litter heats in the icebox 5 F or 10 F, it will definitely warm up in a pile stacked more than 5 feet high. Will it burn down the barn? Probably not. Be cautious if the temperature rises more than 20 F.